The office staff was very pleasant on the phone and in person. Seems like a great business! The cabin was so cozy tucked in the middle of the woods next to a noisy creek. The outdoor living space kept us outside most of the time- even through the rain! Inside was comfortable and quaint. We would love to visit this cabin again, but next time stay longer! VERY FREINDLY, FROM BEGINNING TO END. THEY DO GREAT JOBS! IT WAS SO PEACEFUL AND QUIET. WE WENT TO SPEND TIME WITH OUR GROWN SONS AND THIER SOON TO BE WIVES. OUR FIRST REAL FAMILY VACATION WITH THEM. WE HAD A GREAT TIME AND DID NOT WANT TO LEAVE. IT WAS NOT LONG ENOUGH. NEXT TIME WE HOPE TO STAY 4-5 DAYS. I love the cabin it was clean and had you feeling like you were in your own home had everything we needed. Looking to come back in October. There was a storm the morning of the day of our arrival and a team member called us to let us know there may be trees down or no electricity. They also called the next morning to make sure everything was ok. We were impressed by how proactive they were. They were awesome!! I had previously rented another cabin in another place prior to this one. The other company gave out my cabin without me knowing it. I called Southern Comfort last minute and they accomadated at an even better price than the other rental company! Thank you!!! This is my second time patronizing southern comfort and it was a great experience just like the first. I was a bit early and the agent allowed me to check in without any pushback or additional fees. We had fun!!! The cabin was equipped with everything we needed in the kitchen. It was a very relaxing time and nice short getaway. They were very helpful, very kind and explained everything well. It was our third time staying in the same house. we love it and couldn't ask for a better place to stay. 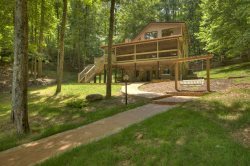 Very roomy ,wonderful screened porch with incredible views. I can't think of anything else we could want from a vacation house. Kim was wonderful in person and on the phone. Always friendly and knowledgeable. Thank you Kim. We loved Elevation 2020. It had everything we needed and more. My family enjoyed this cabin 100%. It was clean, there was plenty of room for everyone, and it was a peaceful place to relax and unwind. The view was splendid, we loved the Jacuzzi and just sitting out roasting marshmallows. We had a wonderful experience. The cabin felt homey. It was decorated with love, for sure!!! The cabin was beautiful. The decor was spot on and the utilities were a relief. This cabin was incredible. It, by far, exceeded our expectations. The photos on the website do not do it justice. The view was gorgeous. The kitchen was extremely well stocked with every pot and pan you need. There is a Kuerig coffee maker so take your pods. Our dog was made very welcome with bowls and a bed. Just a fabulous experience. Thank you owners. The most relaxing and enjoyable time we have ever had in the last 35 years minus our honeymoon. Team was excellent and very knowledgeable about the property. This was our 4th time staying with Southern Comfort Cabin Rentals and we have loved every single property we've stayed in. Bear Paw did not disappoint and the view was amazing. Looking forward to our return visit in November. Brought a group of my clients for stay. We had the time of our lives and will return soon. Property had a blessed feel to it as we felt blessed to be there. Upon check-in the staff was very professional, friendly and helpful. I have always wanted to partake of a stay in a mountain view cabin and I couldn't be more pleased about my experience of spending my 52nd Birthday @ the cabin "Mile High". The cabin, the views, the amenities exceeded my expectations as well as those of my guests. We have already decided we will be booking again in the near future and I have gladly shared my experience and the contact information for Southern Comfort Cabin Rentals with my family, friends, Co-workers and colleagues. Thank you Amy and All the staff of Southern Comfort Cabin Rentals for making my experience such an Amazing one that I will Never forget!!!! We loved it and plan to return soon.